Don’t get lost in the ocean of black gym bags! Stand out in style with this fun animal print! 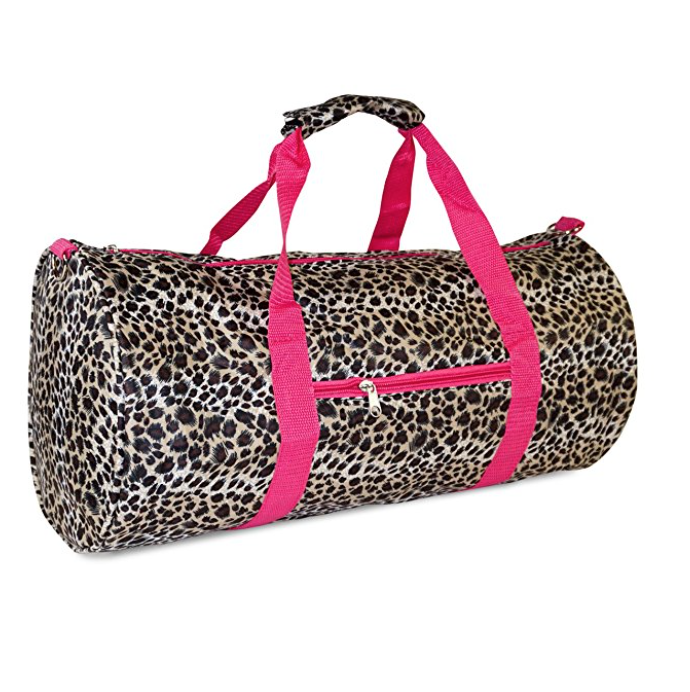 This lightweight Leopard print luggage is great for gym workout enthusiast and can be used for a quick, close by staycation or for a weekend excursion to your favorite retreat. It’s chic and fashionable design makes it a perfect choice for transporting gear for dance teams and cheer squads too! Also makes an ideal personality flaunting gym bag! You can carry your cute duffle by its included durable, detachable shoulder strap or slide it easily over the handle of a rolling suitcase for stress-free and efficient, stylish transport. Fully lined with black linen, keeping it clean is easy! Never lose your boarding pass, ID, or other smaller items with an exterior zipper pocket on the front of this security checkpoint friendly bag.